Sea Life Park is the latest of a string of companies, both big and small, announcing layoffs in the past six months due to financial pressures and pullouts. Sea Life Park is cutting 44 full- and part-time employees this week, citing a decline in attendance, just months after its acquisition by the Parques Reunidos Group of Madrid. Jesus Bravo, the park's general manager, said the company was saddened to have to let people go, but had no option due to a loss in revenues. The latest cuts represent about 20 percent of the staff at the park, including seasonal staff hired for peak summer months. 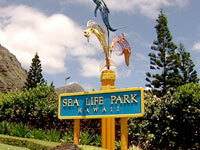 Sea Life Park is the latest company to announce layoffs resulting from Hawaii's economic downturn. Local tourist attractions feeling the pinch. The aquatic amusement park is trimming 44 full- and part-time employees -- or about 20 percent of its staff -- starting this week due to a decline in attendance. Jesus Bravo, general manager, said temporary hires for peak summer months that normally would have been kept until the end of August were among the laid-off employees, but did not specify how many. Sea Life Park also declined to say in which departments the layoffs were occurring, only that it was across several areas. "We are saddened to have to take this step," Bravo said in a written statement. "These are all good employees, but unfortunately, given the loss in revenues, we have no option but to cut back on operating costs." This round of layoffs is on top of another one in fall 2007, when Sea Life Park cut 49 employees for a "seasonal adjustment." Prior to that round, the park had 270 workers, which it says was its highest employment level. Staff were supposed to be rehired during the Christmas season when business picked up, but that was never confirmed. In late April, Parques Reunidos Group of Madrid acquired the 22-acre park from Mexico-based Dolphin Discovery, owner since January 2005. 274 | Maui Land & Pineapple Co.
Parques Reunidos said its goal was to make Sea Life Park a world-class attraction, but said at the time no personnel changes would result from the sale. At the time, the park said it had about 200 employees. Bravo was retained as the park's manager. Sea Life Park is only the latest in a string of companies to announce layoffs resulting from the economic downturn. Earlier this week, 34 workers from the North Beach Grill at Kaanapali Beach Club were notified of their termination amid contract talks with the hotel workers union Unite Here! Local 5. The Honolulu Advertiser, Hawaii's largest daily newspaper, announced last month it was trimming 54 workers from its staff, amid contract talks with the Hawaii Newspaper and Printing Trades Council. Hospitals and nonprofit groups also have taken a hit, with the North Hawaii Community Hospital and Bishop Museum announcing staff cuts as well. The Big Island hospital laid off 54, and Bishop Museum 14, citing financial difficulties. Employers said the slump in visitor numbers, which plummeted in June by 14.2 percent, its worst level since June 2003, has taken its toll on business, in addition to the credit crunch and waning real estate market. Maui Land & Pineapple Co. last month cut staff 26 percent in an effort to stem losses from rising energy and operating costs while shifting away from its focus on pineapple farming. In June, Hawaii's seasonally adjusted unemployment rate rose to 3.8 percent, up from 3.5 percent in May. Bank of Hawaii forecasts the state's unemployment rate will exceed 4 percent this year, and hit 5 percent next year, according to chief economist Paul Brewbaker. "It's been anticipated," said Brewbaker of recent job cuts. "It's actually already in our forecast." On the other hand, companies are also hiring, he noted. "Layoffs are a last resort, not a first resort," he said. "Hiring is also not the first thing companies do. In either case, employment decisions tend to follow, not lead. In this particular environment, what we're seeing is a reflection of what's been going on in the economy for some time." Gov. Linda Lingle authorized the extension of 13 additional weeks of federally funded unemployment benefits for Hawaii, which went into effect on July 6 and will last until March 31. Without the extension, unemployment insurance benefits last 26 weeks.